This good-looking 7 x 5 tongue and groove shed has much to offer. The stability of the building is assured by the high quality tongue and groove work. The timber locks together, and therefore offers a stronger framework for the building. The tongue and groove work also ensures that rainwater is not an issue. The building also complies with the sustainable code. This is ideal for property developers, because it means it can fit into their project needs quite easily. There are a lot of things we like about this shed on first inspection. 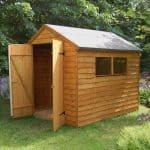 Whether safety is your top priority or you are simply looking for a shed that will add visual appeal to the garden, this is an excellent choice. It comes with a number of customisable options and is small enough to fit in any garden. 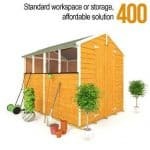 There’s also the fact that it is one of the more affordable sheds on the market. Choice of lock – If safety is one of your biggest concerns, you will love the choice of lock feature included with this model. You can choose from a BSI, hasp and staple or Rim lock. Code for sustainable homes compliant – The Code for Sustainable Homes is fairly recent and it mainly affects property developers. It is basically an environmental assessment which shows how environmentally friendly new homes are. 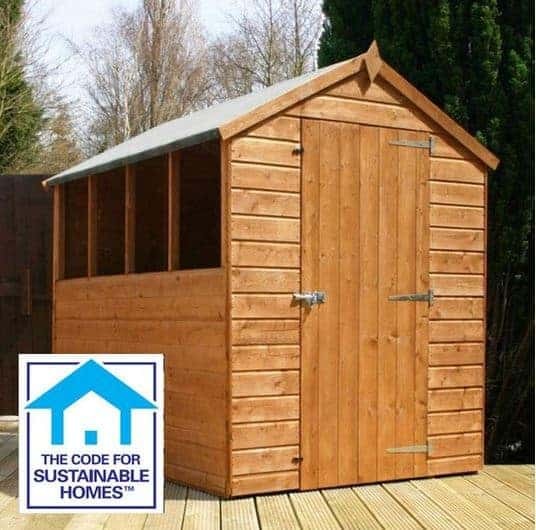 This shed is Code for Sustainable Homes compliant which makes it a great choice for property developers and those concerned with the environment. 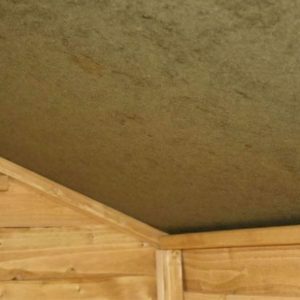 Choice of roofing felts – Another customisable option, you can choose the level of roofing felt included with the shed. Styrene glazed windows – The windows of this shed are styrene glazed providing a shatterproof design. Shiplap tongue and groove cladding – Constructed with Shiplap tongue and groove cladding, the shed benefits from a super-strong, durable finish. 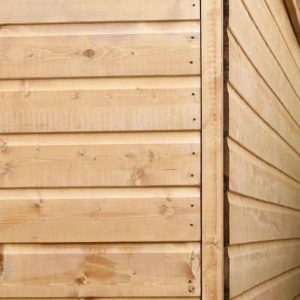 It is the highest quality type of cladding used by manufacturers and features a channel that causes rainwater to run off the shed quickly and easily. 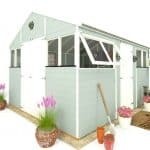 Solid sheet 8mm roof and 10mm floor – The shed comes with solid sheet materials to add strength to the roof and floor. Easy to install, these materials give the shed a more durable finish. 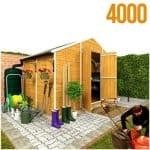 10 year anti-rot guarantee – For peace of mind the shed comes with a 10 year anti-rot guarantee. FSC certified – The wood used to construct the shed are taken from sustainable woodland, giving it a more environmentally friendly design. All measurements above are in feet and inches. We are impressed by the number of safety features included with this model. The choice of lock is a particularly good feature. The shed comes with a standard Rim lock, though you can upgrade to a BSI Rim lock or a hasp and staple. The styrene glazed windows are also a good addition as their shatterproof design ensures you needn’t worry if you are small children prone to breaking things. Finally the solid construction lets you store heavy items and provides a stable, secure structure. Due to the Shiplap tongue and groove cladding being thicker and more durable, it does make the panels lot heavier. 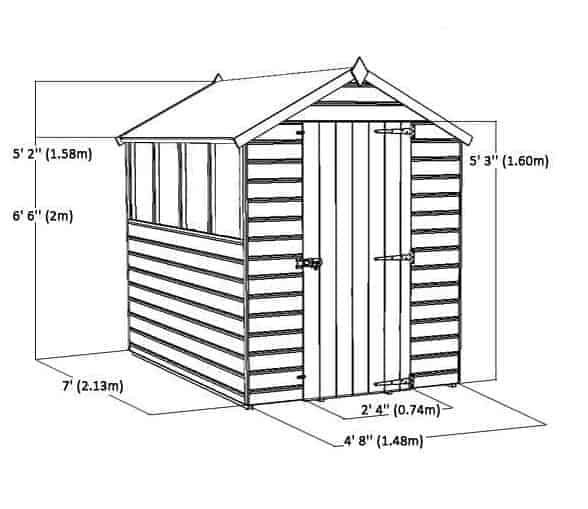 Therefore compared to some other sheds of the same size, this one is slightly more difficult to construct. It is for that reason we have given it a 7.5 out of 10 rating. The actual build itself is easy enough to follow and you shouldn’t come across any major problems. Just be aware that it is a heavy and time consuming job. We are huge fans of Shiplap cladding shed designs. Not only does it ensure a superior quality finish, but it also provides an attractive design too. The panels appear smooth and have a thick, sturdy looking design. The thickness of the timber provides more than just visual and simple durability benefits; it also makes the shed harder to break into. This is an important feature as the window enables potential thieves to see the contents of the shed. So if they do decide to try to break in, the lock and heavy duty design will make it tough to get into. The windows are also coated with styrene which means they are also really durable. The shatterproof design also makes them safer for installation in gardens where young children could cause potential damage. 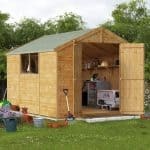 Another thing we like about this shed is that it performs highly in terms of weatherproof benefits. The apex roof, sand mineral felt and the channel in the cladding all help to ensure rainwater runs away from the shed before it has a chance to build up. The tongue and groove aspect of the construction also leaves an expansion gap which adds to its weatherproof benefits, ensuring it doesn’t warp over time. The strength of the shed is impressive. It not only ensures maximum longevity, but it also enables you to hang shelving and heavy objects onto the walls. This increases its storage capacity. The shed will need to be treated once it has been built. For Shiplap cladding we recommend you use a spirit based treatment. These tend to penetrate into the materials, rather than resting on the surface. If you’re looking to add colour to the shed, you will find the spirit based treatments provide limited options. You do have the choice to use a water based treatment as they do come in a variety of colours. However, they will need to be applied each year. There isn’t anything we don’t like about this shed. While it does come at a slightly higher cost than others of its size, it more than makes up for this with its strong, exceptional quality design. The manufacturers have covered everything from safety to weatherproof benefits. 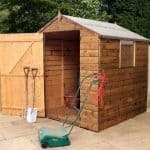 If you’re looking for a shed that is guaranteed to last you for years to come then this is one you should definitely consider.